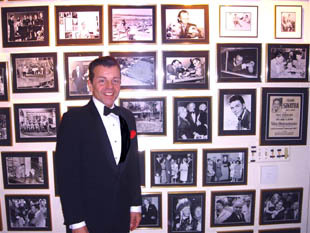 Considered the closest Sinatra lookalike in the world, our Frank Sinatra Tribute Artist is a terrific impersonator and lookalike who performs either as a solo vocalist to Nelson Riddle and Billy May Orchestra’s arrangements on CD tracks or backed by an 8-piece swing band, a big band or with a 20-piece Nelson Riddle-style orchestra with strings. He also has Mr. S’ inflections and mannerisms down to a “t”! He’s performed for the Sinatra family. For those looking for a duo act, he’s available performing a “Frank and Marilyn Show” with our Marilyn tribute artist. A same-day rehearsal will almost always be required if hired to perform with a live band. He is available in Southern California, San Francisco, Las Vegas and virtually every city in the U.S. and Canada. We hope you enjoy his live promo video with a Southern California Nelson Riddle-style orchestra below.